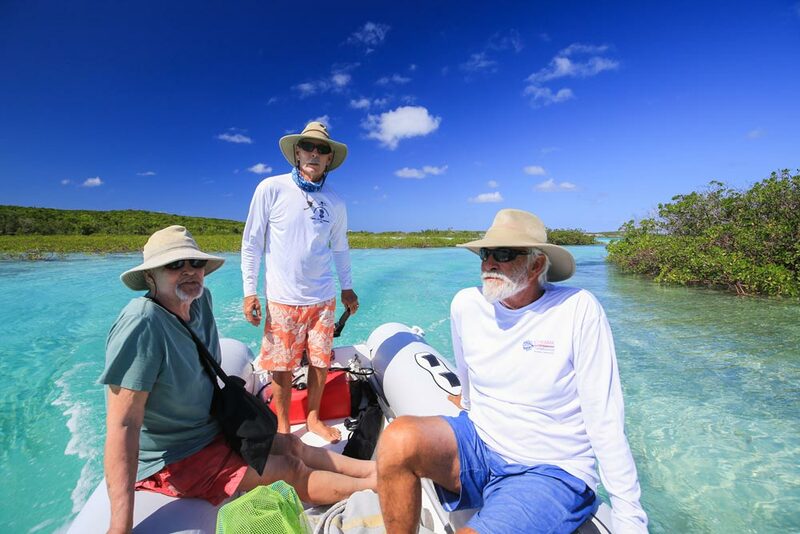 Between Salt Pond Cay and Calabash Bay, Long Island. 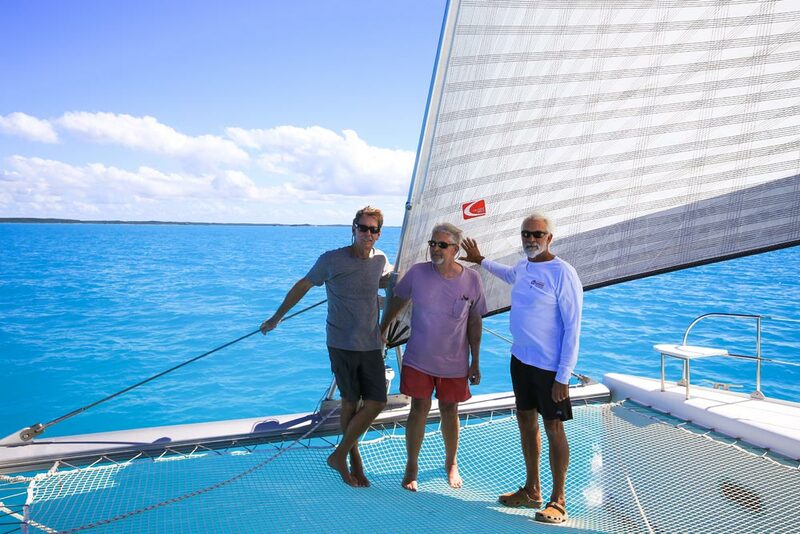 Our captains have agreed that the persistent east-northeast wind blowing at 25+ knots is not good for sailing down the eastern windward shore of Long Island. 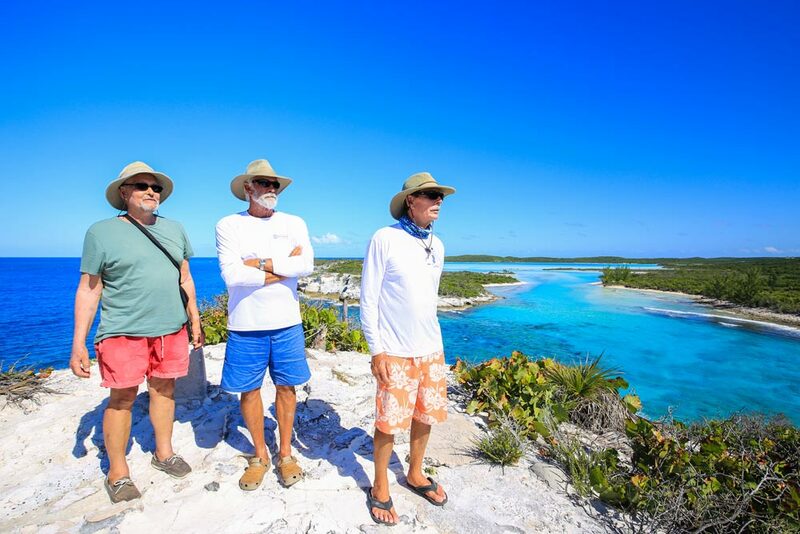 So we took advantage of two lay days to explore the beauty of this western side of Long Island, sparsely populated by Bahamian fishermen who welcome visitors with heart-warming old-fashioned grace. The weather forecast for Monday, 7 November, consistently shows a northeast wind blowing slower than 20 knots which is ideal for us. This will give us an opportunity to examine several places recorded by Admiral Morison. 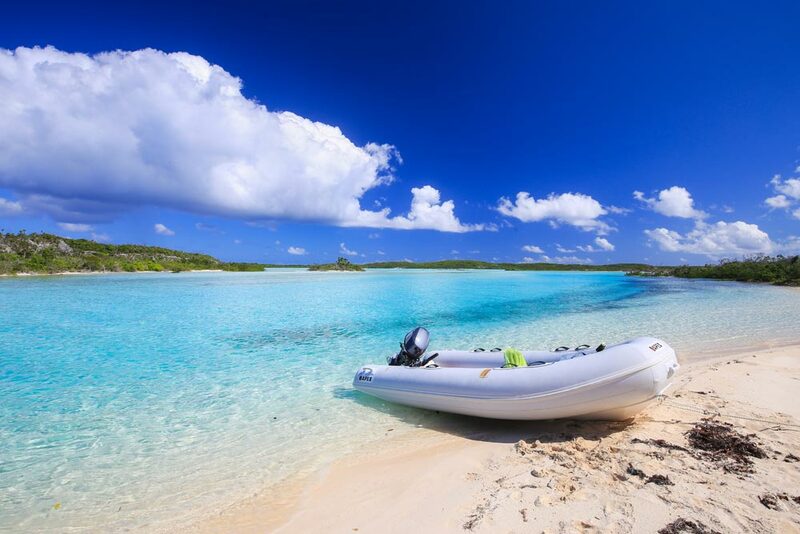 On the afternoon of 4 November, we explored with our inflatable tender a gorgeous shallows of multiple shades of turquoise water over bright white sand lying between Newton Cay, which marks the northern extremity of Long Island, and Long Island itself. We spotted several sting rays, an abundance of young lightning-flippered sea turtles, a shiny dark-eyed barracuda, and a bluish-silver needle fish that danced wigglingly above water on its tail to escape our shadow! The entrance to these shallows is next a high cliff the colour of Devonshire cream. 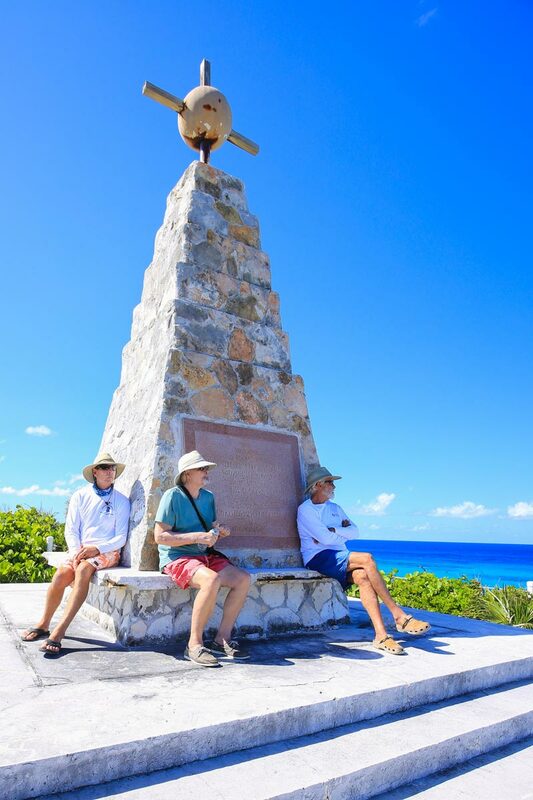 On top of it the Bahamian government has built a light and high monument celebrating the presumed arrival of Christopher Columbus here on 17 October 1492. The subsequently-added pink marble plaque celebrates the presence of Long Island’s “gentle, friendly and happy” Lucayan natives who had peopled these islands from the 8th century on and who were quickly exterminated by Spanish slavers. From this western eminence you can see the sea on the east side of Long Island and a far view south of this long green island. 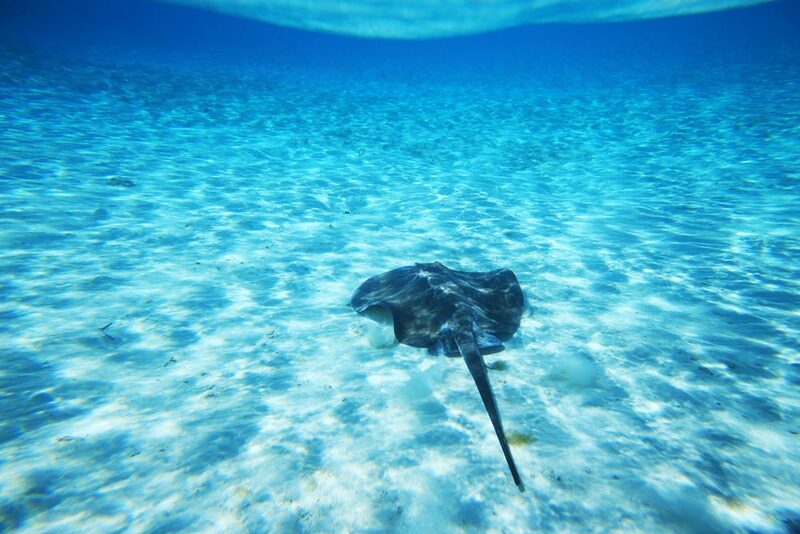 A sting ray reposes in the shallows behind Newton Cay. 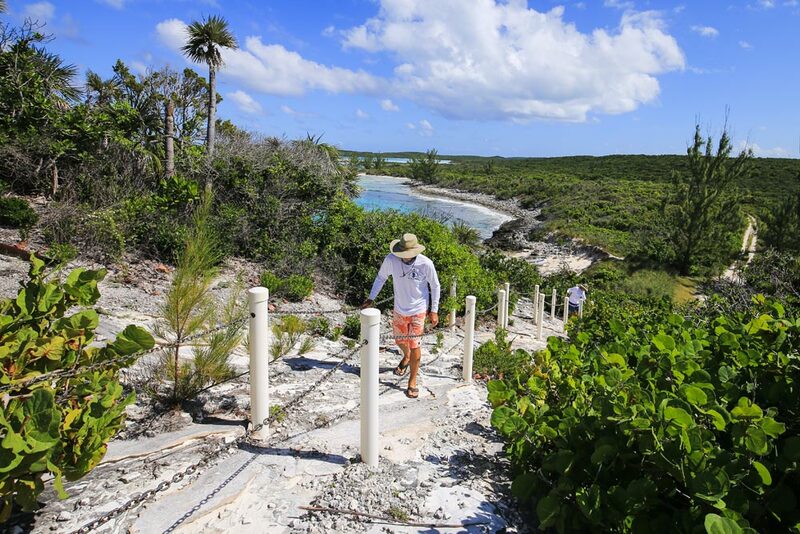 Exploring the mangroves behind Newton Cay, Long Island. 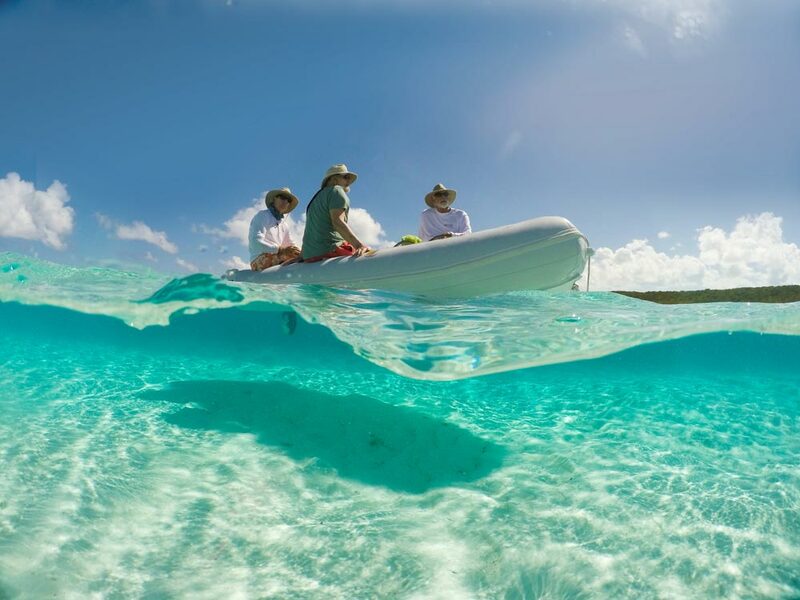 In the course of navigating out of these shallows into the sea in our inflatable, we had to gauge carefully the waves rolling into the entrance to the shallows over a coral bottom made threatening by the size of the waves. 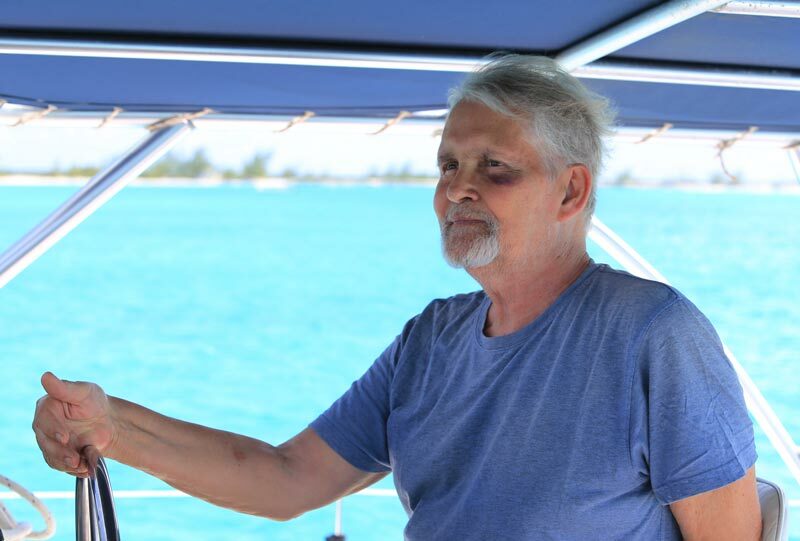 A larger than usual wave caught us abeam and catapulted your writer into our luggage at the bottom of the tender from which he emerged with a magnificent black eye he intends to wear proudly for the rest of the expedition! A conclusion from this is that it becomes more difficult to propose this place as an anchorage for Columbus’s fleet the afternoon of 17 October. 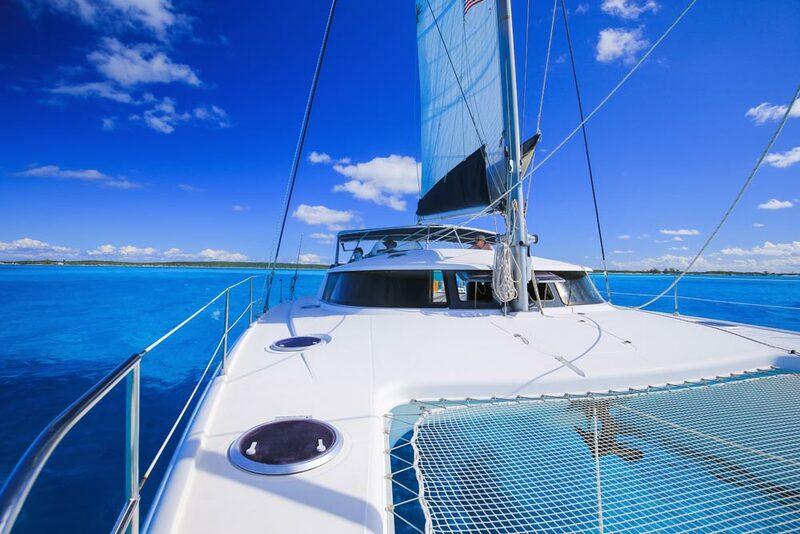 This adverse wind gives us a chance to review Columbus’s route among the islands on 17 October. 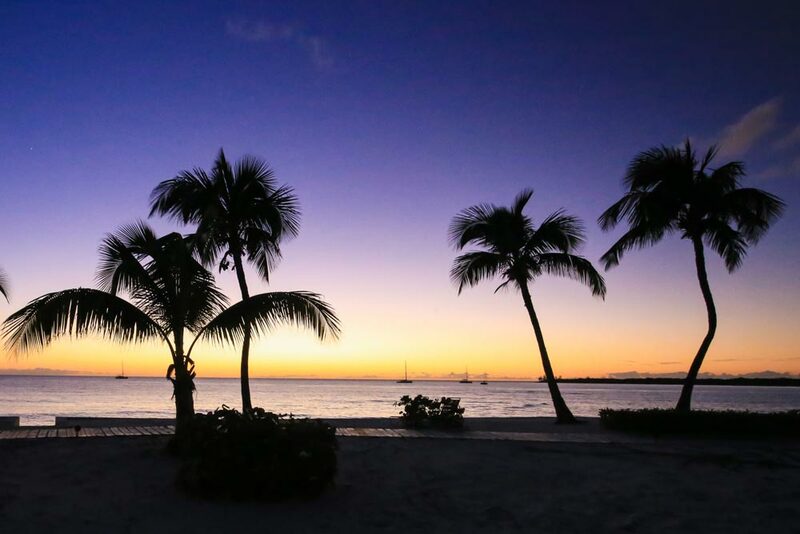 The morning of the 17th, Columbus writes that he anchors near a settlement to which the solitary Lucayan he’d hoisted aboard with his canoe at sea had retired the evening before. Admiral Morison identifies this place as east of the modern settlement of Burnt Ground in 1942, and in 1963, amends this identification to include a possible anchorage east of the settlement of Simms. On 7 November after examining them, our two captains will give their opinions of both these asserted anchorages. Around noon of 17 October, Columbus departs his first anchorage at his third island which he names Fernandina after Ferdinand, King of Aragon and King of Spain. In line 30 of folio 13 verso of his Diario, Columbus states that he understood a native “of whom I had signs on this south side, …” that the sought island of the larger presumed gold-rich Samoet, an island larger than Fernandina, lay to its south and southeast. Our tender beached near the foot of Cape Santa Maria, Long Island. This information given on folio 13 verso tells us 1) that he is on the south side of his third island, and 2) that Samoet is larger than Fernandina and lies to its south and southeast. According to Admiral Morison, Columbus is now anchoring off the windward eastern coast of the northern part of the island he names Fernandina and which Morison identifies as Long Island. In order for Morison’s Samoet to be larger than Long Island you must lump Acklins and Crooked Islands together with Fortune Island/Long Cay to make this true. Columbus’s statement that he is anchored on the south side of Fernandina is corroborated three pages earlier on folio 12 recto, lines 20 through 23, where Columbus describes Fernandina as “ flat without any mountain, thus like San Salvador and Santa Maria. And all beaches without rocks, ….” Generally in these islands, a windward shore is swept clean of sand and a lee shore is all beaches without rocks. On Monday we’ll be coasting the windward shore of Long Island. Some twenty years ago I flew along this very coast and found it to consist largely of forbidding ironshore. Captain Tim mounts the steep path to the Columbus Monument, Cape Santa Maria, Long Island. Navigating to the north-northwest along the coast of Fernandina, Columbus writes that he anchors off the entrance to a marvelous harbour with two mouths separated by an “isleo,” but, entering it with the fleet’s skiff and boats, finds it too shallow for his nao and caravels. Nevertheless, he sends his men into a native settlement in quest of water. I’ve given Spanish and Portuguese meanings of the Portuguese term “isleo” at the end of my translation of Columbus’s thirteen days among the Lucayan Islands on our website. It can mean both a small island and a reef exposed by an outgoing tide. The Columbus Monument, Cape Santa Maria, Long Island. Captain Dave, Captain Tim and Josiah on Cape Santa Maria, Long Island. Admiral Morison identifies this “marvelous harbour” in 1942 as the shallows behind large Newton Cay which we explored on 4 November. I submit that the word “isleo” which Morrison ascribes to Bird Rock to the northwest of Crooked Island can hardly be ascribed to large Newton Cay. In 1963, the Admiral identifies Columbus’s anchorage of the afternoon of 17 October as either Cape Santa Maria Harbour or Hossie Harbour south of it, or Calabash Bay where we anchored the night of 4 November. In 1974, Morrison identifies the “marvelous harbour” as the place we explored on 4 November and where I got my black eye. In his 1963 translation Morison asserts that the wind the afternoon of 17 October was southwest and south, which could have made an anchorage at Santa Maria Harbour risky. Admiral Morison described the high cliff bordering the entrance to his “wonderful Harbour” just after noting that Columbus described Fernandina as being flat with no mountain like San Salvador and Santa Maria. With all these inconsistencies, it has already become difficult to agree with Admiral Morison’s assertion of Columbus’s route among the Lucayan islands. Further exploration in the days to come will show, I believe, that no First Landing in the central Bahamas is valid. The black-eyed scholar sails on. Destiny II sails south from Calabash Bay, Long Island. Captain Dave, Josiah and Captain Tim on Destiny II, the west coast of Long Island. View from the Santa Maria Club, Calabash Bay, Long Island.